Directed by Malcolm D. Lee, Barbershop: The Next Cut picks back up right where we left off: at the old neighborhood haunt — Calvin’s Barbershop. However, Calvin (Ice Cube) and Angie (Regina Hall) are now co-owners of a co-ed barbershop/salon hybrid. The men and the women are working side by side, and, naturally, this brings forth some pretty amusing (and sensitive) topics. Despite the Gender War taking place in the middle of his shop, Calvin has bigger fish to fry. He soon begins to worry about the gang violence that’s been erupting around Southside, and what this means for those he loves, particularly his impressionable son Jalen (Michael Rainey Jr.). Calvin’s own “gang” decides to hold a city-wide ceasefire at the barbershop for one entire weekend — meaning no guns, no bloodshed, and free haircuts for two whole days — in an attempt to mitigate the violence in their neighborhood and call national attention to a problem that typically gets left by the wayside. To classify The Next Cut as a comedy would be a flimsy misnomer, by no means is this a light film. Sure, it has funny parts, but ultimately this is an issue-laden dramedy about the struggles of modern Black America. We’re dealing with things like inner city gang violence, gun violence, police brutality, racism, sexism, gender stereotypes, hypermasculinity, female beauty standards, sexism, and adultery. Add in hair, and you’ve got yourself a movie jam-packed with almost every conceivable social, economic, racial, political, and marital issue that generally affects people of color today. Plus, there’s a dance-off. This could have easily turned into a sappy Lifetime movie, and it almost did, but because of the sheer likeability of all the actors (including Cedric the Entertainer as Eddie) and the sincere way in which these issues are presented, thankfully, it does not. There’s nuance in the way these people’s lives are depicted, and there’s incredible depth to the struggles they face. The biggest battle is certainly between Calvin and his son Jalen, who is considering joining a local gang in order to become a “real man” and to, of course, fit in. This heartfelt father-son narrative showcases the struggle of being the parent of a black child in a time when it’s dangerous to be so. Their dynamic forces questions like: How does a father make his child understand that a system in favor of one race breeds a warped sense of self and violence in another? Or, hardest of all, how does one tell a teenage boy that he must walk away from “what’s cool” in order to become more than what his peers tell him he must be? These are incredibly important (and timely) issues that I’m very glad The Next Cut was bold enough to face head-on. Amid all the gravity and the seriousness, there are still quite a few laugh-out-loud moments, mostly thanks to secondary characters like tenacious entrepreneur One-Stop (J.B. Smoove), adorkable haircutter Jerrod (Lamorne Morris — who will always be Winston in my heart), odd-Indian out Raja (Utkarsh Ambudkar), and the creepy yet lovable Dante (Deon Cole). These four fellas stirred up the ridiculousness and levity that this very politically-minded film needed. And you’ll be surprised to know that Nicki Minaj was not the worst actor of the bunch. In fact, she was quite tolerable. Bonus Features include The Next Cut: Barbershop Bootcamp, Deleted Scenes with Malcolm D. Lee, and everybody’s favorite — the Gag Reel. 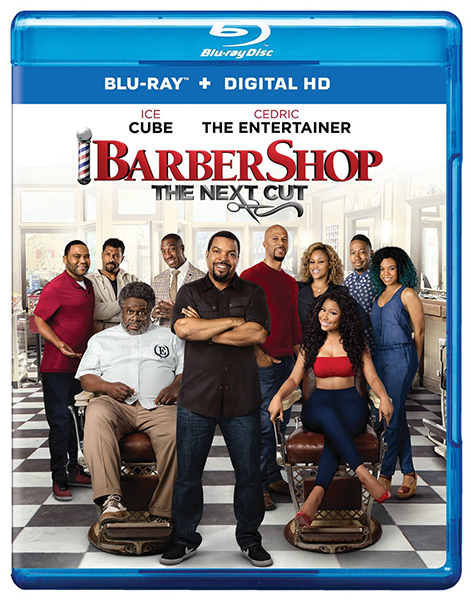 Have you seen Barbershop: The Next Cut? Click here to review it for yourself. So funny I had an aneurysm. JK. Allen Maldonado discusses his new show, The Last O.G., and how it's tackling the big issues of gentrification, fatherhood, and life after incarceration.